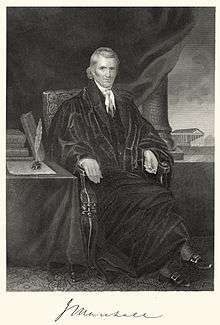 John Marshall (September 24, 1755 – July 6, 1835) was the fourth Chief Justice of the Supreme Court of the United States (1801–1835). His court opinions helped lay the basis for United States constitutional law and many say made the Supreme Court of the United States a coequal branch of government along with the legislative and executive branches. Previously, Marshall had been a leader of the Federalist Party in Virginia and served in the United States House of Representatives from 1799 to 1800. He was Secretary of State under President John Adams from 1800 to 1801. The longest-serving Chief Justice and the fourth longest-serving justice in U.S. Supreme Court history, Marshall dominated the Court for over three decades (34 years) and played a significant role in the development of the American legal system. Most notably, he reinforced the principle that federal courts are obligated to exercise judicial review, by disregarding purported laws if they violate the constitution. Thus, Marshall cemented the position of the American judiciary as an independent and influential branch of government. Furthermore, Marshall's court made several important decisions relating to federalism, affecting the balance of power between the federal government and the states during the early years of the republic. In particular, he repeatedly confirmed the supremacy of federal law over state law, and supported an expansive reading of the enumerated powers. Some of his decisions were unpopular. Nevertheless, Marshall built up the third branch of the federal government, and augmented federal power in the name of the Constitution, and the rule of law. Marshall, along with Daniel Webster (who argued some of the cases), was the leading Federalist of the day, pursuing Federalist Party approaches to build a stronger federal government over the opposition of the Jeffersonian Republicans, who wanted stronger state governments. John Marshall was born in a log cabin in Germantown, a rural community on the Virginia frontier, in what is now Fauquier County, near Midland, on September 24, 1755, to Thomas Marshall and Mary Isham Keith, the granddaughter of politician Thomas Randolph of Tuckahoe. 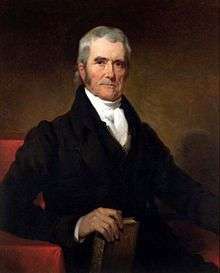 John Marshall was of almost entirely English ancestry, though his mother also had some distant Scottish ancestry as well. The oldest of fifteen, John had eight sisters and six brothers. Also, several cousins were raised with the family. From a young age, he was noted for his good humor and black eyes, which were "strong and penetrating, beaming with intelligence and good nature". His younger brother, James Markham Marshall, also served briefly in a newly created judgeship for the Federal judiciary on the Circuit Court of the District of Columbia from 1801 to 1803, and three of his brothers, Keith, William and Charles were lawyers. 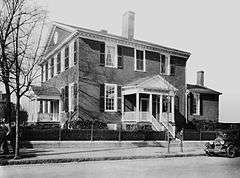 Marshall loved his home, built in 1790, in Richmond, Virginia, and spent as much time there as possible in quiet contentment. For approximately three months each year, Marshall lived in Washington during the Court's annual term, boarding with Justice Story during his final years at the Ringgold-Carroll House. Marshall also left Richmond for several weeks each year to serve on the circuit court in Raleigh, North Carolina. He also maintained the D. S. Tavern property in Albemarle County, Virginia from 1810–1813. Marshall himself was not religious, and although his grandfather was a priest, never formally joined a church. He did not believe Jesus was a divine being, and in some of his opinions referred to a deist "Creator of all things." He was an active Freemason and served as Grand Master of Masons in Virginia in 1794–1795 of the Most Worshipful Grand Lodge of Ancient, Free, and Accepted Masons of the Commonwealth of Virginia. While in Richmond, Marshall attended St. John's Church on Church Hill until 1814 when he led the movement to hire Robert Mills as architect of Monumental Church, which was near his home and rebuilt to commemorate 72 people who died in a theater fire. The Marshall family occupied Monumental Church's pew No. 23 and entertained the Marquis de Lafayette there during his visit to Richmond in 1824. Thomas Marshall was employed in Fauquier County as a surveyor and land agent by Lord Fairfax, which provided Marshall with a substantial income. 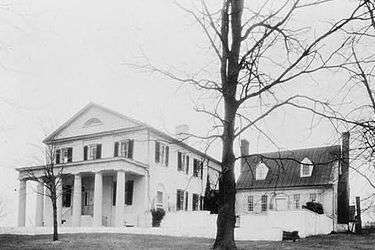 In the early 1760s, the Marshall family left Germantown and moved about 30 miles (48 km) miles to Leeds Manor (so named by Lord Fairfax) on the eastern slope of the Blue Ridge Mountains. On the banks of Goose Creek, Thomas Marshall built a wood frame house, with two rooms on the first floor and a two-room loft above. Thomas Marshall was not yet well established, so he leased it from Colonel Richard Henry Lee. The Marshalls called their new home "the Hollow", and the ten years they resided there were John Marshall's formative years. Marshall's early education was superintended by his father who gave him an early taste for history and poetry. Thomas Marshall's employer, Lord Fairfax, allowed access to his home at Greenway Court, which was an exceptional center of learning and culture. Marshall took advantage of the resources at Greenway Court and borrowed freely from the extensive collection of classical and contemporary literature. There were no schools in the region at the time, so home schooling was pursued. Although books were a rarity for most in the territory, Thomas Marshall's library was exceptional. His collection of literature, some of which was borrowed from Lord Fairfax, was relatively substantial and included works by the ancient Roman historian Livy, the ancient Roman poet Horace, and the English writers Alexander Pope, John Dryden, John Milton, and William Shakespeare. All of the Marshall children were accomplished, literate, and self-educated under their parents' supervision. At the age of twelve John had transcribed Alexander Pope's An Essay on Man and some of his Moral Essays. There being no formal school in Fauquier County at the time, John was sent, at age fourteen, about one hundred miles from home to an academy in Washington parish. Among his classmates was James Monroe, the future president. John remained at the academy one year, after which he was brought home. Afterward, Thomas Marshall arranged for a minister to be sent who could double as a teacher for the local children. The Reverend James Thomson, a recently ordained deacon from Glasgow, Scotland, resided with the Marshall family and tutored the children in Latin in return for his room and board. When Thomson left at the end of the year, John had begun reading and transcribing Horace and Livy. The Marshalls had long before decided that John was to be a lawyer. William Blackstone's Commentaries on the Laws of England had been published in America and Thomas Marshall bought a copy for his own use and for John to read and study. After John returned home from Campbell's academy he continued his studies with no other aid than his dictionary. John's father superintended the English part of his education. Marshall wrote of his father, "... and to his care I am indebted for anything valuable which I may have acquired in my youth. He was my only intelligent companion; and was both a watchful parent and an affectionate friend". In 1788, Marshall was selected as a delegate to the Virginia convention responsible for ratifying or rejecting the United States Constitution, which had been proposed by the Philadelphia Convention a year earlier. Together with James Madison and Edmund Randolph, Marshall led the fight for ratification. He was especially active in defense of Article III, which provides for the Federal judiciary. His most prominent opponent at the ratification convention was Anti-Federalist leader Patrick Henry. Ultimately, the convention approved the Constitution by a vote of 89–79. Marshall identified with the new Federalist Party (which supported a strong national government and commercial interests), and opposed Jefferson's Republican Party (which advocated states' rights and idealized the yeoman farmer and the French Revolution). Meanwhile, Marshall's private law practice continued to flourish. He successfully represented the heirs of Lord Fairfax in Hite v. Fairfax (1786), an important Virginia Supreme Court case involving a large tract of land in the Northern Neck of Virginia. In 1796, he appeared before the United States Supreme Court in another important case, Ware v. Hylton, a case involving the validity of a Virginia law providing for the confiscation of debts owed to British subjects. Marshall argued that the law was a legitimate exercise of the state's power; however, the Supreme Court ruled against him, holding that the Treaty of Paris in combination with the Supremacy Clause of the Constitution required the collection of such debts. Henry Flanders in his biography of Marshall remarked that Marshall's argument in Ware v. Hylton "elicited great admiration at the time of its delivery, and enlarged the circle of his reputation." Flanders also wrote that the reader "cannot fail to be impressed with the vigor, rigorous analysis, and close reasoning that mark every sentence of it." In 1795, Marshall declined Washington's offer of Attorney General of the United States and, in 1796, declined to serve as minister to France. In 1797, he accepted when President John Adams appointed him to a three-member commission to represent the United States in France. (The other members of this commission were Charles Cotesworth Pinckney and Elbridge Gerry.) However, when the envoys arrived, the French refused to conduct diplomatic negotiations unless the United States paid enormous bribes. This diplomatic scandal became known as the XYZ Affair, inflaming anti-French opinion in the United States. Hostility increased even further when the French Foreign Minister Talleyrand refused to negotiate with Marshall and Pinckney, prompting their departure from France in April 1798. Marshall's handling of the affair, as well as public resentment toward the French, made him popular with the American public when he returned to the United States. In 1798, Marshall declined a Supreme Court appointment, recommending Bushrod Washington, who would later become one of Marshall's staunchest allies on the Court. In 1799, Marshall reluctantly ran for a seat in the United States House of Representatives. Although his congressional district (which included the city of Richmond) favored the Democratic-Republican Party, Marshall won the race, in part due to his conduct during the XYZ Affair and in part due to the support of Patrick Henry. His most notable speech was related to the case of Thomas Nash (alias Jonathan Robbins), whom the government had extradited to Great Britain on charges of murder. Marshall defended the government's actions, arguing that nothing in the Constitution prevents the United States from extraditing one of its citizens. On May 7, 1799, President Adams nominated Congressman Marshall as Secretary of War. However, on May 12, Adams withdrew the nomination, instead naming him Secretary of State, as a replacement for Timothy Pickering. Confirmed by the United States Senate on May 13, Marshall took office on June 6, 1800. As Secretary of State, Marshall directed the negotiation of the Convention of 1800, which ended the Quasi-War with France and brought peace to the new nation. Elected as a delegate to the Virginia Constitutional Convention of 1829-1830, John Marshall advanced his view that the electorate should be expanded in Virginia by the provision that any white male who had served in the War of 1812 or who would serve in the militia in the future defense of the country deserved the right to vote. Marshall served as Chief Justice during the administrations of six Presidents: John Adams, Thomas Jefferson, James Madison, James Monroe, John Quincy Adams and Andrew Jackson. He remained a stalwart advocate of Federalism and a nemesis of the Jeffersonian school of government throughout its heyday. He participated in over 1000 decisions, writing 519 of the opinions himself. While Chief Justice, he was elected a Fellow of the American Academy of Arts and Sciences in 1804. Marshall was also elected a member of the American Antiquarian Society in 1813. He helped to establish the Supreme Court as the final authority on the meaning of the Constitution in cases and controversies that must be decided by the federal courts. According to the Oyez Project, Marshall's impact on constitutional law is without peer, and his imprint on the Court's jurisprudence remains indelible. Marshall was thrust into the office of Chief Justice in the wake of the presidential election of 1800. With the Federalists soundly defeated and about to lose both the executive and legislative branches to Jefferson and the Democratic-Republicans, President Adams and the lame duck Congress passed what came to be known as the Midnight Judges Act, which made sweeping changes to the federal judiciary, including a reduction in the number of Justices from six to five (upon the next vacancy in the court) so as to deny Jefferson an appointment until two vacancies occurred. As the incumbent Chief Justice Oliver Ellsworth was in poor health, Adams first offered the seat to ex-Chief Justice John Jay, who declined on the grounds that the Court lacked "energy, weight, and dignity." Jay's letter arrived on January 20, 1801, and as there was precious little time left, Adams surprised Marshall, who was with him at the time and able to accept the nomination immediately. The Senate at first delayed, hoping that Adams would make a different choice, such as promoting Justice William Paterson of New Jersey. According to New Jersey Senator Jonathan Dayton, the Senate finally relented "lest another not so qualified, and more disgusting to the Bench, should be substituted, and because it appeared that this gentleman [Marshall] was not privy to his own nomination". Marshall was confirmed by the Senate on January 27, 1801, and received his commission on January 31, 1801. While Marshall officially took office on February 4, at the request of the President he continued to serve as Secretary of State until Adams' term expired on March 4. President John Adams offered this appraisal of Marshall's impact: "My gift of John Marshall to the people of the United States was the proudest act of my life." Soon after becoming Chief Justice, Marshall changed the manner in which the Supreme Court announced its decisions. Previously, each Justice would author a separate opinion (known as a seriatim opinion) as was done in the Virginia Supreme Court of his day and is still done today in the United Kingdom and Australia. Under Marshall, however, the Supreme Court adopted the practice of handing down a single opinion of the Court, allowing it to present a clear rule. As Marshall was almost always the author of this opinion, he essentially became the Court's sole spokesman in important cases. Marshall also got rid of the tradition that U.S. Supreme Court justices had inherited from the British of wearing ornate powdered wigs and red robes with ermine trim. In his Ogden dissent, Marshall also adopted a definition of the word "law" that would later be denounced by the individualist anarchist Lysander Spooner: "a rule of civil conduct prescribed by the supreme power in a State." Marshall was in the dissenting minority only eight times throughout his tenure at the Court, partly because of his influence over the associate justices. As Oliver Wolcott observed when both he and Marshall served in the Adams administration, Marshall had the knack of "putting his own ideas into the minds of others, unconsciously to them". However, he regularly curbed his own viewpoints, preferring to arrive at decisions by consensus. He adjusted his role to accommodate other members of the court as they developed. Marshall had charm, humor, a quick intelligence, and the ability to bring men together. His sincerity and presence commanded attention. His opinions were workmanlike but not especially eloquent or subtle. His influence on learned men of the law came from the charismatic force of his personality and his ability to seize upon the key elements of a case and make highly persuasive arguments Together with his vision of the future greatness of the nation, these qualities are apparent in his historic decisions and gave him the sobriquet, The Great Chief Justice. Marshall ran a congenial court; there was seldom any bickering. The Court met in Washington only two months a year, from the first Monday in February through the second or third week in March. Six months of the year the justices were doing circuit duty in the various states. Marshall was therefore based in Richmond, his hometown, for most of the year. When the Court was in session in Washington, the justices boarded together in the same rooming house, avoided outside socializing, and discussed each case intently among themselves. Decisions were quickly made usually in a matter of days. Marshall wrote nearly half the decisions during his 33 years in office. Lawyers appearing before the court, including the most brilliant in the United States, typically gave oral arguments and often did not present written briefs. The justices did not have clerks, so they listened closely to the oral arguments, and decided among themselves what the decision should be. The court issued only one decision; the occasional dissenter usually did not issue a separate opinion. In the case of Marbury and Madison, the federal judges declared that commissions, signed and sealed by the President, were valid, although not delivered. I deemed delivery essential to complete a deed, which, as long as it remains in the hands of the party, is as yet no deed, it is in posse only, but not in esse, and I withheld delivery of the commissions. They cannot issue a mandamus to the President or legislature, or to any of their officers. More generally, Jefferson lamented that allowing the Constitution to mean whatever the Court says it means would make the Constitution "a mere thing of wax in the hands of the judiciary, which they may twist and shape into any form they please." The Constitution does not explicitly give judicial review to the Court, and Jefferson was very angry with Marshall's position, for he wanted the President to decide whether his acts were constitutional or not. Historians mostly agree that the framers of the Constitution did plan for the Supreme Court to have some sort of judicial review; Marshall made their goals operational. Judicial review was not new and Marshall himself mentioned it in the Virginia ratifying convention of 1788. Marshall's opinion expressed and fixed in the American tradition and legal system a more basic theory—government under law. That is, judicial review means a government in which no person (not even the President) and no institution (not even Congress or the Supreme Court itself), nor even a majority of voters, may freely work their will in violation of the written Constitution. Marshall himself never declared another law of Congress or act of a president unconstitutional. It is the peculiar province of the legislature to prescribe general rules for the government of society; the application of those rules to individuals in society would seem to be the duty of other departments. Based on this separation of powers principle, Marshall questioned whether the rescinding act would be valid even if Georgia were a completely sovereign state independent of the federal Constitution. Ultimately, though, Marshall grounded the Court's opinion in the restrictions imposed by the federal Constitution. As in Marbury, this decision of the Court in Fletcher was unanimous. The text of the McCulloch v. Maryland decision, handed down March 6, 1819, as recorded in the minutes of the Supreme Court of the United States. McCulloch v. Maryland (1819) was one of several decisions during the 1810s and 1820s involving the balance of power between the federal government and the states where Marshall affirmed federal supremacy. He established in McCulloch that states could not tax federal institutions, and upheld congressional authority to create the Second Bank of the United States, even though the authority to do this was not expressly stated in the Constitution. While Marshall's opinion in McCulloch was consistent with Marbury v. Madison, it cut the other way by affirming the constitutionality of a federal statute while preventing states from passing laws that violate federal law. The opinion includes the famous statement, "We must never forget that it is a constitution we are expounding." Marshall laid down the basic theory of implied powers under a written Constitution; intended, as he said "to endure for ages to come, and, consequently, to be adapted to the various crises of human affairs ...." Marshall envisaged a federal government which, although governed by timeless principles, possessed the powers "on which the welfare of a nation essentially depends." It would be free in its choice of means, and open to change and growth. According to The New York Times, "Marshall did not intend his words as license for Congress to do whatever it wishes." Instead, Marshall and the Court deemed the bank necessary and proper because it furthered various legitimate ends that are listed in the Constitution, such as regulating interstate commerce. Cohens v. Virginia (1821) displayed Marshall's nationalism as he enforced the supremacy of federal law over state law, under the Constitution's Supremacy Clause. In this case, he established that the Federal judiciary could hear appeals from decisions of state courts in criminal cases as well as the civil cases over which the court had asserted jurisdiction in Martin v. Hunter's Lessee (1816). Justices Bushrod Washington and Joseph Story proved to be his strongest allies in these cases. In Marshall's day, the Court had not yet been given the discretion whether or not to take cases. Scholars such as Edward Hartnett contend that the Court's discretionary certiorari practice undercuts the rationale that Chief Justice Marshall gave in the Cohens case for reviewing the validity of state law, which was that the Court had no choice in the matter. The decision in Cohens demonstrated that the federal judiciary can act directly on private parties and state officials, and has the power to declare and impose on the states the Constitution and federal laws, but Marshall stressed that federal laws have limits. For example, he said, "Congress has a right to punish murder in a fort, or other place within its exclusive jurisdiction; but no general right to punish murder committed within any of the States." In this case, the Court affirmed that the Virginia Supreme Court correctly interpreted a federal statute that had established a lottery in Washington D.C. Like the Jefferson administration in Marbury, the State of Virginia technically won this case even though the case set a precedent consolidating the Court's power. Webster was at that time a member of Congress, but nevertheless pressed his constitutional views on behalf of clients. After he won this case, he bragged that Marshall absorbed his arguments "as a baby takes in his mother's milk", even though Marshall had actually dismissed Webster's main argument. The enumeration presupposes something not enumerated; and that something, if we regard the language or the subject of the sentence, must be the exclusively internal commerce of a state.....Inspection laws, quarantine laws, health laws of every description, as well as laws for regulating the internal commerce of a State, and those which respect turnpike roads, ferries, &c., are....subject to State legislation. If the legislative power of the Union can reach them, it must be for national purposes; it must be where the power is expressly given for a special purpose, or is clearly incidental to some power which is expressly given. The immediate impact of the historic decision in Gibbons was to end many state-granted monopolies. That in turn lowered prices and promoted free enterprise. Under Marshall's leadership and pen, the Supreme Court established the foundational framework for relations between the United States and indigenous American tribes in the cases Johnson v. M'Intosh (1823), Cherokee Nation v. Georgia (1831), and Worcester v. Georgia (1832). The first case asserted a doctrine of federal primacy in relations with Indian tribes, resolving a land dispute in favor of the party who had obtained his land grant from the federal government over a claim to the land established by having purchased it directly from the tribe. 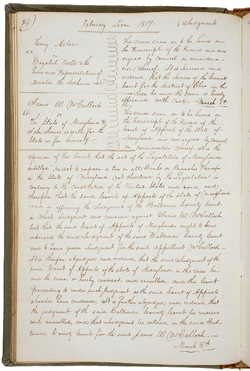 The second case refused to recognize indigenous tribes as foreign nations, holding instead that they were "domestic dependent nation[s]" whose relationship with the United States was comparable to that of a "ward to a guardian"; however, Marshall did recognize and acknowledge the inherent right of each tribe to sovereignty on their tribal lands. The final case again upheld tribal sovereignty and reasserted federal supremacy with respect to tribal affairs by protecting tribal sovereignty from incursions by the states, holding that the laws of a state have no force on tribal lands within that state's geographical boundaries. The case resulted from a criminal prosecution of a preacher for entering Indian lands in violation of Georgia statute. It is often reported that in response to the Worcester decision President Andrew Jackson declared "John Marshall has made his decision; now let him enforce it!" More reputable sources recognize this as a false quotation. In fact, the ruling in Worcester ordered nothing more than that Samuel Worcester be freed; Georgia complied after several months. Marshall wrote several other important Supreme Court opinions, including the following. In Barron v. Baltimore, 32 U.S. 243 (1833), the Court held that the Bill of Rights was intended to apply only against the federal government, and therefore does not apply against the states. The courts have since incorporated most of the Bill of Rights with respect to the States through the Fourteenth Amendment to the United States Constitution, which was adopted 33 years after Marshall's death. In Mima Queen v. John Hepburn the majority opinion written by Marshall argued against the use of hearsay evidence stating "That hearsay evidence is incompetent to establish any specific fact, which fact is in its nature susceptible of being proved by witnesses who speak from their own knowledge." Marshall greatly admired George Washington, and between 1804 and 1807 published an influential five-volume biography. Marshall's Life of Washington was based on records and papers provided to him by the late president's family. The first volume was reissued in 1824 separately as A History of the American Colonies. The work reflected Marshall's Federalist principles. His revised and condensed two-volume Life of Washington was published in 1832. Historians have often praised its accuracy and well-reasoned judgments, while noting his frequent paraphrases of published sources such as William Gordon's 1801 history of the Revolution and the British Annual Register. After completing the revision to his biography of Washington, Marshall prepared an abridgment. In 1833 he wrote, "I have at length completed an abridgment of the Life of Washington for the use of schools. I have endeavored to compress it as much as possible. ... After striking out every thing which in my judgment could be properly excluded the volume will contain at least 400 pages." The Abridgment was not published until 1838, three years after Marshall died. In 1823–1824, although Marshall had always been loyal to the now-defunct Federalist Party, he was asked to re-enter the political arena as a Democratic-Republican Party candidate for the Office of U.S. President in time for the 1824 U.S. Presidential Election. He turned this offer down. Marshall was among many slave owners who supported the abolition movement. As a young attorney, he represented prominent Virginia abolitionist Robert Pleasants, who sought to enforce his father's will and free slaves, although such was illegal at the time his late father had written the will. Although Marshall won before Chancellor George Wythe and the specific slaves were ultimately freed, in the final opinions in that case, Virginia justice Spencer Roane (who would become Marshall's rival) began enunciating the rationale for slaveholding as a property right, contrary to the lofty principles of natural law enunciated by Judge Wythe (and his former pupil Thomas Jefferson in the U.S. Declaration of Independence). Marshall's good friend John Wickham was another of the architects of the legal rationales for slaveholding which transformed Richmond into a leading slave-trading center. 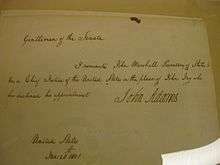 In 1823, Marshall became the first president of the Richmond branch of the American Colonization Society, which was dedicated to resettling freed American slaves in Liberia, on the West coast of Africa. In 1825, as Chief Justice, Marshall wrote an opinion in the case of the captured slave ship Antelope, in which he acknowledged that slavery was against natural law, but upheld the continued enslavement of approximately 1/3 of the ship's cargo (although the remainder were to be sent to Liberia). In his last will and testament, Marshall gave his elderly manservant the choice either of freedom and travel to Liberia, or continued enslavement under his choice of Marshall's children. Among the few Founding Fathers who lived longer than Marshall were James Madison, Aaron Burr, and Paine Wingate. Marshall was also the last surviving Cabinet member from the John Adams administration. In 1831, the 76-year-old Marshall traveled to Philadelphia, Pennsylvania and underwent an operation to remove bladder stones. He recovered from it without complications, but his wife died at the end of the year and his health quickly declined from that point onward. In June 1835, Marshall again traveled to Philadelphia for medical treatment, where he died on July 6 at the age of 79, having served as Chief Justice for over 34 years. Two days before his death, Marshall enjoined his friends to place only a plain slab over his and his wife's graves, and wrote the simple inscription himself. His body, which was taken to Richmond, lies in Shockoe Hill Cemetery. The memorial inscription on his tombstone reads as follows: "Son of Thomas and Mary Marshall/was born September 24, 1755/Intermarried with Mary Willis Ambler/the 3rd of January 1783/Departed this life/the 6th day of July 1835." The three previous chief justices (John Jay, John Rutledge, and Oliver Ellsworth) had left little permanent mark beyond setting up the forms of office. 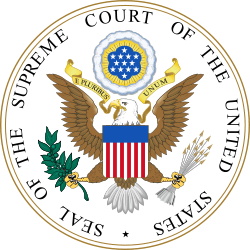 The Supreme Court, like many state supreme courts, was a minor organ of government. In his 34-year tenure, Marshall gave it the energy, weight, and dignity of what many would say is a third co-equal branch of the U.S. government. With his associate justices, especially Joseph Story, William Johnson, and Bushrod Washington, Marshall's Court brought to life the constitutional standards of the new nation. Marshall's home in Richmond, Virginia, has been preserved by Preservation Virginia (formerly known as the Association for the Preservation of Virginia Antiquities). It is considered to be an important landmark and museum, essential to an understanding of the Chief Justice's life and work. 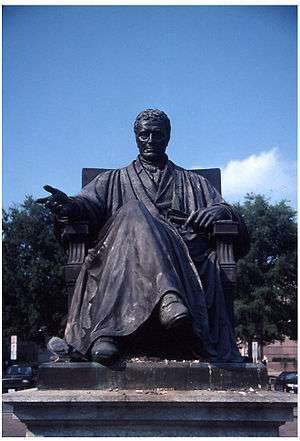 The United States Bar Association commissioned sculptor William Wetmore Story to execute the statue of Marshall that now stands inside the Supreme Court on the ground floor. Another casting of the statue is located at Constitution Ave. and 4th Street in Washington D.C. and a third on the grounds of the Philadelphia Museum of Art. Story's father Joseph Story had served as an Associate Justice on the United States Supreme Court with Marshall. The statue was originally dedicated in 1884. Having grown from a Reformed Church academy, Marshall College, named upon the death of Chief Justice John Marshall, officially opened in 1836 with a well-established reputation. After a merger with Franklin College in 1853, the school was renamed Franklin and Marshall College. The college went on to become one of the nation's foremost liberal arts colleges. Additionally, four law schools and at least two colleges today bear his name: The Marshall-Wythe School of Law (now William and Mary Law School at the College of William and Mary in Williamsburg, Virginia; The Cleveland-Marshall College of Law in Cleveland, Ohio; John Marshall Law School in Atlanta, Georgia; and, The John Marshall Law School in Chicago, Illinois. The colleges that bear his name are Franklin and Marshall College in Lancaster, Pennsylvania and Marshall University in Huntington West Virginia. Marshall County, Illinois, Marshall County, Indiana, Marshall County, Kentucky and Marshall County, West Virginia are also named in his honor. A number of high schools around the nation have also been named for him. John Marshall's birthplace in Fauquier County is a park, the John Marshall Birthplace Park, and a marker can be seen on Route 28 noting this place and event. North Marshall Mountain 38°46′34″N 78°12′11″W﻿ / ﻿38.776°N 78.203°W﻿ / 38.776; -78.203 and South Marshall Mountain 38°46′19″N 78°13′12″W﻿ / ﻿38.772°N 78.220°W﻿ / 38.772; -78.220 in Shenandoah National Park are named after him. Playing chess was "a favorite pastime" of Chief Justice Marshall. A sculpture, The Chess Players is located near a statue of the Chief Justice in John Marshall Park in Washington, DC. Marshall, Michigan was named in his honor five years before Marshall's death. It was the first of dozens of communities and counties named for him. Marshall County, Kentucky was named in his honor. 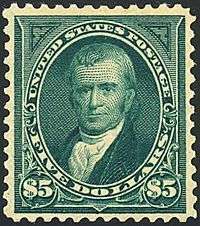 Virginia State Route 55, from Front Royal, Virginia to Gainesville, Virginia, is named "John Marshall Highway" in Marshall's honor. Humphrey Marshall (1760 – July 3, 1841), a United States Senator from Kentucky, was the first cousin and brother-in-law of the chief justice. Thomas Francis Marshall (June 7, 1801 – September 22, 1864) a lawyer who was elected U.S. Representative from Kentucky, was a nephew of the chief justice. Charles Marshall (1830–1902), great-nephew to John Marshall and colonel in the Confederate Army who served as an aide de camp to Robert E. Lee when the latter commanded the Army of Northern Virginia during the Civil War. Mary Marshall Harvie (September 17, 1795 – April 29, 1841) Only Daughter of John Marshall married to Maj. General Jaquelin Burwell Harvie, son of Col. John Harvie Jr.
Thomas Jefferson (April 13, 1743 – July 4, 1826) primary author of the U.S. Declaration of Independence and President of the United States, was a relative of Marshall on his mother's side. Both Marshall and Jefferson were descendants of the Virginia colonist William Randolph. George C. Marshall (December 31, 1880 – October 16, 1959) was an American military leader, General of the U.S. Army, Chief of Staff of the Army, Secretary of State, the third Secretary of Defense, and the author of the Marshall Plan, for which he was awarded the Nobel Peace Prize. He was a distant relative of the chief justice. Hobson, Charles. The Great Chief Justice: John Marshall and the Rule of Law (University Press of Kansas, 1996). ISBN 978-0-7006-0788-4. Johnson, Herbert Alan, "John Marshall" in Leon Friedman and Fred L. Israel, eds. The Justices of the United States Supreme Court: Their Lives and Major Opinions – Vol. 1 (1997) pp. 180–200. ISBN 0-313-27932-2. Johnson, Herbert A. The Chief Justiceship of John Marshall from 1801 to 1835. University of South Carolina Press, 1998. 352 pp. ISBN 978-1-57003-121-2. Newmyer, R. Kent. John Marshall and the Heroic Age of the Supreme Court Louisiana State University Press, 2001. 511 pp. ISBN 978-0-8071-2701-8. Simon, James F. What Kind of Nation: Thomas Jefferson, John Marshall, and the Epic Struggle to Create a United States. Simon & Schuster, 2002. 348 pp ISBN 978-0-684-84871-6. Unger, Harlow Giles, John Marshall, The Chief Justice Who Saved the Nation (Boston: Da Capo Press, 2014). White, G. Edward (2001). "Reassessing John Marshall". William and Mary Quarterly. 58 (3): 673–93. JSTOR 2674300. ↑ See here for maps of where the Marshall land was located within Germantown. Cf. http://www.johnmarshallfoundation.org/john-marshall/historic-landmarks/birth-place-of-john-marshall/. ↑ Connelley, William Elsey; Coulter, E.M. (1922). "Capt. Pendleton Farmer De Weese Keith". In Kerr, Charles. History of Kentucky. III. New York: The American Historical Society. p. 122. 1 2 Jefferson's mother and Marshall's maternal grandmother were first cousins, because their fathers were both sons of William Randolph and Mary Isham. See Beveridge, Albert. The Life of John Marshall: Frontiersman, Soldier Lawmaker (Beard Books 2000). ↑ "John Marshall House, Richmond, Virginia.". ↑ "National Park Service, Marshall's Richmond home.". ↑ Clarence J. Elder & Margaret Pearson Welsh (August 1983). "National Register of Historic Places Inventory/Nomination: D. S. Tavern" (PDF). ↑ Smith. "John Marshall": 36, 406. .
↑ Tignor, Thomas A. The Greatest and Best: Brother John Marshall at masonicworld.com. ↑ Smith, Jean Edward (1998). John Marshall: Definer of a Nation. Macmillan. pp. 26–27. ISBN 978-0-8050-5510-8. ↑ Oak Hill, Fauquier County, National Park Service, Department of the Interior. ↑ John Marshall at the Biographical Directory of Federal Judges, a public domain publication of the Federal Judicial Center. 1 2 "Life and Legacy", The John Marshall Foundation. ↑ Stites (1981), pp. 11–65. 1 2 Currie, David. The Constitution in the Supreme Court: The First Hundred Years, 1789–1888, p. 136 (Univ. of Chicago 1992). ↑ Flanders, Henry. The Life of John Marshall, pp. 38, and 30–31, Philadelphia, T. & J. W. Johnson & Co., 1905. ↑ Marshall's argument at the bar in Ware v. Hylton is here. 1 2 "Ariens, Michael. "John Marshall."". ↑ Paul Johnson, A History of the American People, p. 237. ↑ "Book of Members, 1780–2010: Chapter M" (PDF). American Academy of Arts and Sciences. Retrieved July 28, 2014. ↑ John Marshall at Supreme Court Historical Society. ↑ Oyez Project, Supreme Court media, John Marshall. ↑ Stites (1981), pp. 77–80. ↑ "John Jay to President John Adams, Jan. 2, 1801, in 4 The Correspondence and Public Papers of John Jay, (Henry P. Johnson ed., 1893)". ↑ Robarge, David (2000). A chief justice's progress: John Marshall from Revolutionary Virginia to the Supreme Court. Greenwood Publishing. p. xvi. ↑ Quoted in Stites (1981), p. 80. ↑ The Marshall Court, 1801–1835, Supreme Court Historical Society. ↑ Currie, David (1992). The Constitution in the Supreme Court: The First Hundred Years, 1789–1888. Univ. of Chicago. pp. 152–55. ISBN 978-0-226-13109-2. .
Ogden v. Saunders, 25 U.S. 213, 347 (1827). ↑ George Gibbs, Memoirs of the Administrations of Washington and John Adams, (1846), vol. II, p. 350. ↑ Fox, John. "Expanding Democracy, Biographies of the Robes: John Marshall". Public Broadcasting Service . ↑ Charles F. Hobson, The Great Chief Justice: John Marshall and the Rule of Law (1996) pp. 15–6, 119–23; the statement to Story is on p. xiv. ↑ A reliable statement of the quote was recounted by Theophilus Parsons, a law professor who knew Marshall personally. Parsons, "Distinguished Lawyers," Albany Law Journal Aug. 20, 1870, pp. 126–27 online. Historian Edward Corwin garbled the quote to: "Now Story, that is the law; you find the precedents for it," and that incorrect version has been repeated. Edward Corwin, John Marshall and the Constitution: a chronicle of the Supreme Court (1919) p. 119. 1 2 "Jefferson, Thomas. Letter to Spencer Roane.". ↑ Coffman, Steve (2012). Words of the Founding Fathers. NC, USA: McFarland. p. 184. ISBN 978-0-7864-5862-2. ↑ "Linder, Doug. "The Treason Trial of Aaron Burr."". ↑ Burns, Arnold and Markman, Stephen. "Understanding Separation of Powers", Pace Law Review, 575, 589 (1987-01-01). 1 2 The New York Times Guide to Essential Knowledge: A Desk Reference for the Curious Mind. MacMillan. 2007. p. 661. ISBN 978-0-312-37659-8. ↑ Before the Evarts Act in 1891, the cases that could reach the Supreme Court were heard as a matter of right, meaning that the Court was required to issue a decision in each of those cases. See Russel R. Wheeler & Cynthia Harrison, Fed. Judicial Ctr., Creating the Federal Judicial System 17–18 (3d ed. 2005). ↑ Hartnett, Edward. "Questioning Certiorari: Some Reflections Seventy-Five Years After the Judges' Bill", Columbia Law Review, Volume 100 (November 2000). 1 2 3 Hall, Kermit and John, Patrick. The pursuit of justice: Supreme Court decisions that shaped America, pp. 29–36 (Oxford University Press 2006). ↑ Virelli, Louis and Leibowitz, David. "'Federalism Whether They Want It Or Not': The New Commerce Clause Doctrine And the Future of Federal Civil Rights Legislation After United States v. Morrison", University of Pennsylvania Journal Constitutional Law, Volume 3, p. 926 (2001). ↑ A History of the American Colonies. ↑ Marshall, John; Widger, David, ed., Life of Washington (Document No. 28859 — Release Date 2009-05-18) at Project Gutenberg. Also see Vol 1. Vol 2. ↑ Foran, William A (October 1937). "John Marshall as a Historian". American Historical Review. 43 (1): 51–64. doi:10.2307/1840187. JSTOR 1840187. .
↑ "Note". Online Library of Liberty . ↑ Marshall, John. "Abridgment". Cary & Lea. ↑ Last Will and Testament, partial transcribed manuscript at Library of Virginia, original having been lost during the Richmond fire set during the Confederate retreat, but portions having been transcribed during an Alexandria Virginia court case. ↑ Smith. "John Marshall. ": 523. ↑ John Curtis Marshall at Find a Grave. ↑ Christensen, George A (19 Feb 2008). "Here Lies the Supreme Court Revisited: Gravesites of the Justices". Journal of Supreme Court History. University of Alabama: Supreme Court Historical Society. 33 (1): 17–41. doi:10.1111/j.1540-5818.2008.00177.x. .
↑ Baume, Sandrine (2011). Hans Kelsen and the Case for Democracy, ECPR Press, pp. 53–54. ↑ Ackerman, Bruce (1991). We the People. ↑ Waldron, Jeremy (2006). "The Core of the case against judicial review," The Yale Law Review, 2006, Vol. 115, pp. 1346–406. ↑ "John Marshall Papers". Special Collections Research Center, Earl Gregg Swem Library, College of William & Mary. Retrieved 4 February 2011. 1 2 Waite, Morrison Remick; Rawle, William Henry; Association, Philadelphia Bar (1884). Exercises at the ceremony of unveiling the statue of John by Morrison Remick Waite, William Henry Rawle, Philadelphia Bar Association – 1884 – Biography & Autobiography – pp. 1, 3, 5 9, 23–29. ↑ "Pictures of large size Federal Reserve Notes featuring John Marshall, provided by the Federal Reserve Bank of San Francisco.". ↑ Pictures of US Treasury Notes featuring John Marshall, provided by the Federal Reserve Bank of San Francisco. ↑ "North Marshall". Peakbagger.com. Retrieved 4 October 2013. ↑ "South Marshall". Peakbagger.com. Retrieved 4 October 2013. ↑ Goode, James M; Seferlis, Clift A (2008). Washington sculpture : a cultural history of outdoor sculpture in the nation's capital. Baltimore: Johns Hopkins University Press. ISBN 9780801888106. Retrieved 2013-03-23. ↑ Page, Richard Channing Moore (1893). "Randolph Family". 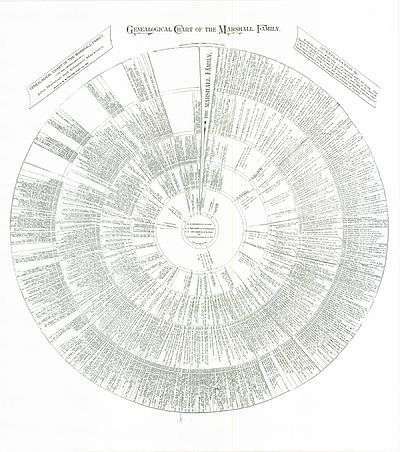 Genealogy of the Page Family in Virginia (2 ed.). New York: Press of the Publishers Printing Co. pp. 249–72. ↑ Glenn, Thomas Allen, ed. (1898). "The Randolphs: Randolph Genealogy". Some Colonial Mansions: And Those Who Lived In Them : With Genealogies Of The Various Families Mentioned. 1. Philadelphia, Pennsylvania: Henry T. Coates & Company. pp. 430–59. ↑ "Online review, John Marshall and the Heroic Age of the Supreme Court.". Lossing, Benson John; William Barrit (December 21, 2005) . Our countrymen, or, Brief memoirs of eminent Americans. Illustrated by one hundred and three portraits. Ann Arbor, Michigan: Scholarly Publishing Office, University of Michigan Library. ISBN 1-4255-4394-4. Smith, Jean Edward (March 15, 1998) . John Marshall: Definer Of A Nation (Reprint ed.). New York, NY: Owl Books. ISBN 0-8050-5510-X. John Marshall, O Say Can You See: Early Washington, D.C., Law & Family, page that networks the involvement of John Marshall in the legal records and proceedings of the Circuit Court for the District of Columbia that were appealed to the Supreme Court between 1800 and 1835. Bennett, Georgia (February 10, 1935). "John and Tom – Rivals in Everything". Richmond Times-Dispatch.